The well-known early New Zealand explorers Heaphy, Brunner and Fox, with their Māori guide Kehu were, in 1846, the first Europeans to see the area where Murchison now stands. After gold was struck in the Upper Buller in the 1860s the Nelson Provincial Government lost no time in planning for a future settlement. Murchison was taken from the name given by renowned geologist Julius von Haast to a nearby mountain in honour of a famous Scottish geologist. Dairy farming became the mainstay of the area when the gold rushes had finished and the forest around Murchison had been milled. Today Murchison provides services for the surrounding farming community as well as the travelling public. With a population of approximately 750 people, Murchison has a museum, information centre, petrol station, and a wide variety of accommodation, several shops, hotels and cafés. Murchison is the gateway to the southern entrance to Kahurangi National Park, New Zealand’s second biggest park at 452,002 ha. The multitude of rivers in the area makes Murchison a white water playground and an angler’s paradise. Walks in the area range from 20 minutes to several days in duration. This brochure covers the short and day walks accessible from Murchison. Safety: The walks outlined in this website are of short duration and are suitable for any reasonably fit person wearing sturdy footwear. Warm clothing, a raincoat, a small first aid kit and something to eat and drink are recommended. An easy loop track abutting the Murchison camping ground at the eastern end of the town. The Kahikatea Reserve is a small remnant of the lowland podocarp forest which would have once dominated the plains around Murchison. The reserve features many fine specimens of kahikatea and mataī trees and a lush ferny understorey. Many forest-dwelling birds can be observed and heard, including bellbirds, tuī, kererū, robins, fantails, silvereyes and kingfishers. This three-kilometre well-formed track is located one kilometre west of Murchison, at the junction of State Highway 6 and Matakitaki West Bank Road. The track zigzags uphill through an attractive remnant of mixed beech/podocarp forest. Native ferns grow on the damp shady slopes of this area. The track emerges from the forest on to open bracken and broom covered slope. Continue the zigzag climb to the skyline. The main rivers that can be seen from here are the Matakitaki which flows from Nelson Lakes National Park to join the Buller River west of Murchison; the Matiri which can be seen flowing from the mountains of Kahurangi National Park in the north. The biggest river seen is the Buller which eventually flows into a gorge — perhaps the most scenic gorge in New Zealand. The road to Westport follows the Buller River to the sea. Access to this track is up the Matakitaki West Bank Road, located one kilometre west of Murchison. After a short stretch of tar sealed road continue along the gravel road for six kilometres. A sign and a small parking area are on your left with the start of the track to the right. top of the big slip. This slip was formed in the 1929 Murchison earthquake and is the feature piece of the walk with the track winding its way through the old slip jumble giving excellent views of the mud stone cliffs that were formed. The track terminates in the middle of the old slip amongst the struggling vegetation, leaving the visitor with a good idea of the magnitude of the shake. Return to the car park the way you came. Robins, tuī, tomtits, grey warblers and bellbirds are commonly heard and seen, with kākā, kākāriki, shining cuckoo and long-tailed cuckoo heard at times. Alert: Do not climb over the barrier above the falls — it is for your safety. Lives have been lost. Accessed from State Highway 65, 23 kilometres south of Murchison, the Maruia Falls track starts from the car park and descends to the Maruia River bank. From here there is an excellent viewpoint of the falls, which were created following the 1929 earthquake. Return to the car park the way you came. This full day walk takes you on a tramping track to tranquil Lake Matiri, in Kahurangi National Park. Access is via the Matiri Valley Road approximately six kilometres north of Murchison. There is a separate publication for this walk. 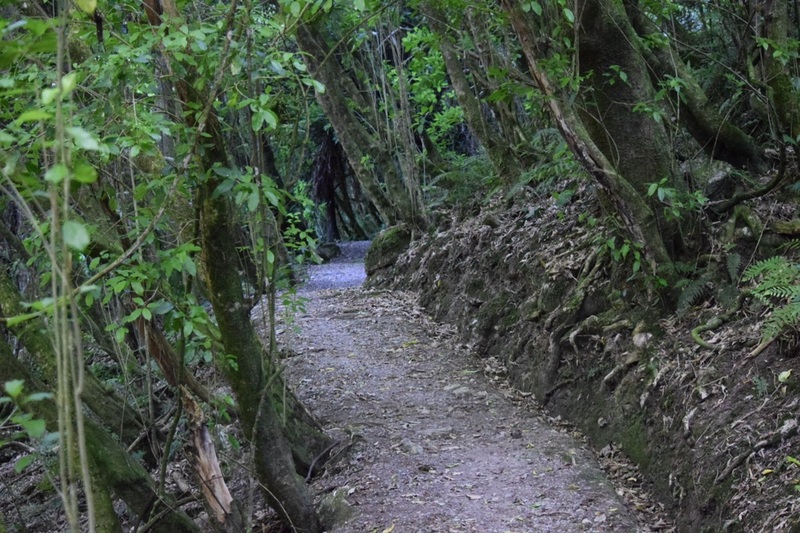 This walkway is situated ten kilometres south of Murchison on the Matakitaki Road. It starts and finishes at the old Six Mile hydro power station by the Six Mile Creek Bridge. The power station and hydro scheme were officially opened on 25 January 1922; the occasion being marked by a public picnic, performances by the town band, speeches and a banquet at the Commercial Hotel. The hydro scheme provided power to Murchison and the scattered homesteads in the Six Mile valley and Four Rivers Plain. It operated for 54 years before being deemed uneconomic and closed in November 1975. The track zigzags 50 metres uphill beside the old penstock to the intake and water storage reservoir. This height provided the necessary head (or fall) for the water to drive the station’s turbine. From here the track initially follows the water race before continuing in the forest on a higher terrace. The track then leads to a viewing platform above the old weir which diverts some of the Six Mile Creek down the water race. Below the weir in the narrow granite gorge are waterfalls and rapids that produce spectacularly turbulent water. On the return there is the option of a loop track which descends from the upper terrace to follow along the water race, before rejoining the main track. Located at Kawatiri Junction at the intersection of State Highway 6 and 63, some 35 kilometres northeast of Murchison, this easy walk follows a short section of the line of the former railway track that ran from Nelson towards Murchison. The walk commences from a car park with information panels detailing the rich history of the area. After some 200 metres the track crosses an old rail bridge before passing through an eerie train tunnel built in 1923. The track returns via beech forest above the Hope River closing the loop at the entrance to the tunnel. A torch is recommended for the tunnel but not essential. This three-kilometre walkway leads you past the remaining features of the once booming township of Lyell — the cemetery, stamping battery and gold mining sites. There are information panels on site and a campground nearby. There is a separate and more detailed brochure available for this walk.